Fresh draft beer, straight from the keg to can, delivered to your door? Welcome to the Ghost Whale Crowler Club! We have a canning machine which means we are able to can all of our 6 keg lines into 500ml cans, known as crowlers. To maximise freshness, we ‘purge’ (fill with neutral gas) the cans before filling, just like on a full scale canning line to minimise the amount of air the beer comes into contact with. The purged can is then filled with fresh beer straight from the tap before being sealed on our canning machine. Our 6 keg lines are constantly changing and it is common for us to have beers on tap that breweries simply don’t bottle or can. The Ghost Whale Crowler Club is your chance to have 6 super fresh draft beers delivered to your door every month. Take a look at our ‘On Tap‘ page to see what’s on tap right now as well as what kegs we have coming up! To join the Ghost Whale Crowler Club simply click the button below and enter your details to set up a direct debit then just wait for your beer to arrive! Payments are taken on the first working day of each month. Crowlers are filled and shipped on the first Tuesday following payment being cleared. Please note that it can take up to 5 working days for a direct debit to be set up so if you sign up right at the end of a month, it may be over a month before your first payment & delivery. 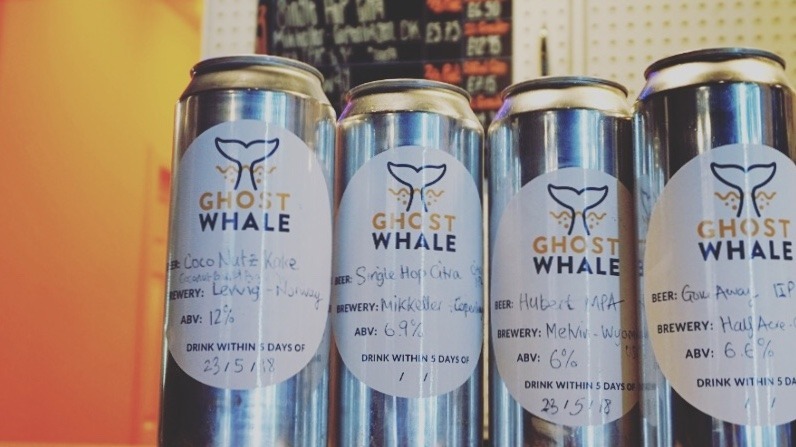 The Ghost Whale Crowler Club costs just £30/month (+£5 delivery to UK address if required). Please note that we do not offer shipping to EU or Northern Ireland for the Crowler Club, sorry. ▸ WHAT DO I GET? Each month you'll receive 6 crowlers (500ml cans) each with a different beer filled fresh from our taps. ▸ WHEN WILL I RECEIVE MY BEER? Direct debits are processed on or shortly after the 1st of each month. Once the payment has cleared we'll fill the crowlers on the next Wednesday and have them collected the same day so that they arrive with you as fresh as possible the next day, ready for the weekend. You will receive an email notification with a link to track your beers or to let you know they're ready to collect if you choose to collect in-store. ▸ WHAT IS THE SHELF LIFE OF A CROWLER? We play things very safe here (drinking beer fresh is always best) and recommend drinking within 5 days. However numerous brewers who have seen our canning process first hand have said that the beer will remain fresh for significantly longer than that as we 'purge' the cans before filling. Maintain freshness by putting crowlers straight in the fridge until you're ready to drink them. ▸ HOW DO I LEAVE THE CROWLER CLUB? We don't tie you into membership. If you decide you want to leave the Crowler Club, simply cancel your direct debit with your bank and send us an email to let us know via beerclub@ghostwhalelondon.com.